Building your own steps to access your deck is possible and can save you money. Knowing the parts of steps: stringers, treads, and risers, helps understand how they are assembled. Read instructions through first, before starting step by step. Select a location for the steps. The area where the bottom of stairs will sit should be flat and level. The bottom of the steps can come to rest upon a concrete sidewalk. If no sidewalk exists, the bottom of the stringers can be attached to posts set into the ground. Steep stairs are not comfortable to climb. Stairs that are too long often lead to treads too wide for comfortable, easy stepping. Each tread width should be 11" deep (two decking boards laid side by side). A comfortable stair rise is 7" up for each step. Find the overall height from the top of the finished deck to the ground. This overall height is called "overall rise." Divide the overall rise by 7 inches (or as close to 7 inches as possible) to find the number that divides the overall rise without a remainder. This number will be how many steps the stairs will require. Go as high as 7.25 inches, but no more, if possible. If going up to 7.25" brings no satisfactory results, then another step must be added, and the search for the proper divisor must begin below the target of 7 inches. For example, if the overall rise is 42", and the search begins at 7", the divided stairs are 6 equal steps of exactly 7" each. Using the target tread depth of 11", the six equal steps will mean that the "overall run" of the stairs will be a bit less than 66". Measure that approximately 66" (or whatever the outcome is of the number of steps multiplied by 11") out from the deck to find the location of the front of the stair. Finding overall run is a matter of finding overall rise divided by a number of comfortable step heights. This will allow clearances to be determined for building codes. Finding the approximate length of stringers will be the third side of a right triangle with the two right sides being the lengths of the rise and the run. Select straight stringers, free from defects and loose knots. Small knots are fine. Selection of the size of treated lumber needed for the stairs will be dictated by a couple factors. First, the length of the stringer lumber must be long enough to account for the entire length of the stringers; bear in mind to account for checks or cracks toward the ends of the lumber. These defects can effectively reduce the length of usable lumber when making cuts of the type used for stair stringers. Second, the width of the lumber (whether 2x10 or 2x12) will be decided by how much stringer material will be left after the cuts are made. The material left should be in the range of at least 4". Check with local regulations regarding this subject. Once the proper stringer material has been selected, the task of "lay-out" of the stringers can begin. The tool for this job is a framing square. Locate the "rise" dimension on one leg of the framing square. Locate the "run" dimension on the other leg of the square. The "run" will actually end up being a bit less than the tread width to allow for a "nose" to hang a little over the riser. 1½ inch is a good nose for the tread. However, use the dimension of 11 inches for the run. Even so, the run will be marked 9 ½ inches over for each step. Mark the 11" and 7" dimensions on the square with masking tape, grease pencil, or stair gauges (little clamps which attach to the square and are used exactly for this purpose). Starting as close to the "upper" end of the stringer as possible, locate and mark the angled line that will represent the plumb line of the overall rise, where the stringer will rest against the deck. Make second mark at 90 degrees to the first mark, intersecting 7" down from the top edge of board where that edge intersects the first "plumb" line. Beginning at the top, using the framing square set to 7" rise and 11" run, start marking out each step down, one at a time, making sure to mark out 9.5" for each step. Note that the very bottom of the stringer will need to have an additional 1 ¼" removed to make it 5 ¾" high. This will allow the first step to be the original 7" rise height once the 1 ¼" decking material is placed on top. The 9.5" for each run will allow 1 ½" of tread to hang over each step making for a more comfortable "nose" on each step. Cut each step out from both directions with circular saw, stopping before crossing lines. Finish cutting out the triangle shapes with a hand saw from both directions for a finished professional looking cut with no extra saw "kerfs" visible. Cut out the entire first stringer and then check it by holding it in place against the deck to be sure everything is ok. Check each "run" for level, and check each "rise" for plumb. By holding the stringer in place, the location of posts can now be marked and dug. The posts should be extended up to facilitate attachment of handrails later. Posts must be located and set plumb and secure in the ground before building the rest of the stair. They must also be placed exactly square out from the deck according to the locations of the outside stringers, so the stringers may be fastened to the posts. Make certain the post heights are high enough to attach handrails at the proper height. This height can be determined later, then marked and cut in place. This is much easier than trying to cut them to length prior to setting in place. If everything checks out fine, and the first stringer is cut, the other stringers can be marked using the first as a pattern. To use it as a pattern, just make certain that you hold it flat on top of the unmarked stringers so as to get the entire pattern to fit. Trace all around the pattern to mark all the cuts on the next stringer. No part of the pattern shall extend beyond any point of the uncut stringer. Also, to make certain the stringers are identical, align the pattern's "bottom" (the edge that will face the ground under the steps) to line up the pattern on all the stringers to be marked. This will compensate for any variances between the different stringer boards in width. And, lumber can indeed vary, even if pulled off the same lumber pile. Once all stringers are cut, measure out the locations for them on the side of the deck. Placing another horizontal 2x board under the rim joist of the existing deck can provide additional nailing for the stringers. Make it one with enough width to allow nailing and solid contact with the entire back of the top of the stringers. Fasten this "nailer" board to the posts under the deck at each side of the stair location. Ideally this board will not extend beyond the sides of the steps. In most cases this nailer is not needed and only provides extra nailing should the stringers be difficult to attach to the deck. Either "toenail" the stringers to the deck with at least 3- 16d nails or 3" screws, more for very long stringers. Or, if possible, secure stringer by driving fasteners from the backside of the deck perimeter joist. For a stair under 4' in width, 3 stringers should be adequate to carry the steps. Space the stringers to allow them to be attached to the posts at the bottom, and to allow the treads to hang over each side by some amount. Four inches is just about right for this tread side overhang. A stringer for every 16" of additional width of stair should be good. 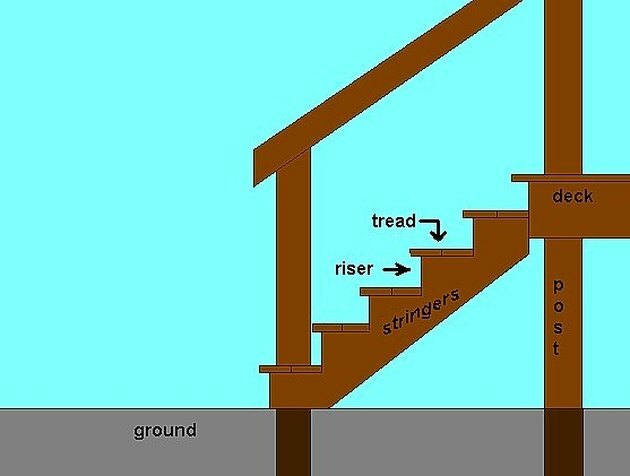 For very wide or long stairs, consider reinforcing stringers as explained in step 4. This will help to eliminate any bounce or movement when walking on the stair. Once stringers are in position, begin by screwing the decking material on to each step. Start at the back of the bottom step on the two sides, then measure and locate the center stringer's position left and right. Next install the front plank for the bottom tread. Notice that both of these treads must be notched to fit around the posts. This can be done with a circular saw, handsaw, and finished with a hammer and chisel. However, short work can be made of it with a good hand held jigsaw. If cuts are made carefully, no trim will be needed later. Trim can be used to hide overly loose or sloppy cuts if needed. Continue to place and secure tread planks working each step from the bottom up, back plank first, and front plank second. If closed riser steps are wanted, or dictated by local building code, 1x treated lumber may be ripped to the height and fastened with screws to the rise of each step.